I had the pleasure of answering some very thoughtful questions for Jean, of The Artful Parent. 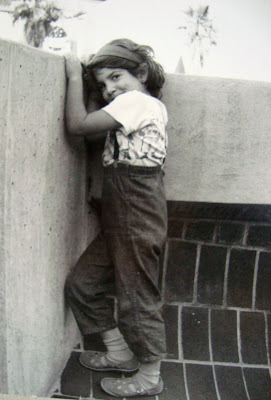 We spoke a bit about my early influences, which inspired me to hunt down some childhood photos to share. In the process, I came across my first embroidery lesson... saved in a scrapbook of all of my early art and writing. I had already prepared a little give-away for Jean's blog based on what we're doing a lot of these days: embroidery. Wonderful! The above photo is from left to right: my first embroidery, my son's first embroidery, and my daughter's first stitching. My daughter didn't use a hoop until recently, and at this point, she was ready for a little challenge. She asked me to help her make a cat. I created a simple pattern and she "traced" it with thread. I'm not one to encourage coloring books and staying in the lines, but I think there is a window in development when a child has mastered certain skills and wants to "practice" something representational. This hand drawn cat template encouraged each stitch to be placed with care. It was a sweet exercise... she loved it! I am offering a child's first embroidery kit as a give-away over at The Artful Parent. Please go have a visit... and I hope you enjoy the interview! Okay, I think we are sisters... when I first saw that photo I thought it was me when I was a kid! This is so fantastic! I love seeing early embroidery from kids - it's such a cool process to watch unfold. I think you're right, too, that they like to have that concrete representational image to help them feel a sense of accomplishment. And what a brilliant little kit. So fantastic! heading over to read the interview now. Cheers! i'm having so much fun watching her develop her own style. i think she, too, will be interested in working on a more representational image. What a cutie pie you are! Loved the interview, and absolutely adore the little embroidery set. Your daughter's cat is perfect! I really do need to attempt to sew with my boys again. 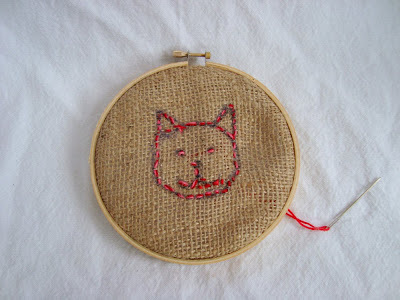 I've been a little hesitant since the first..."incident", but perhaps it's time to have some stitched kitties of my own. I've always been anti colouring in pages for my children. I've always felt it prevented them being creative - nice to know I'm not the only one to think so. Off to read the Artful Parent interview! The stitched kitty is charming. I'm trying to instill crafty and handmade in my kids' lives right now. I loved making things as a little girl and still do. Today we worked on making Christmas cards. They do make a mess, but the time spent together and the end products are such a reward! This is lovely!! What an adorable photo of you as a little girl and I LOVE the fact that you have your first embroidery and your children's work as well. My 6 year old has asked if she can start working with a hoop and I was hoping to get her started on one over winter break -- such perfect timing! Those are great! My daughter (who's 5) has just started doing some stitching with a hoop. Her first looks so very much like your son's. I enjoyed reading the blog interview and especially liked reading about how your ideas became realities. I'm an idea person and it's hard to release fear and start creating. Thank you for the story! I love your photo at Bart in SF! I love that you encourage your children as I did mine and now do with my grand children to draw outside the lines....and the cat is wonderful too. Soon she will be drawing her own to thread paint or embroider over! I should have thought of introducing my kids to embroidery. My son asked to learn how to knit, but I think we're a year or so away from that. So sweet. Open ended embroidery is so special and a great way to start. I have also blogged about my daughter's first stitchings. Maya, what a lovely interview! I love your blog... so creative!! 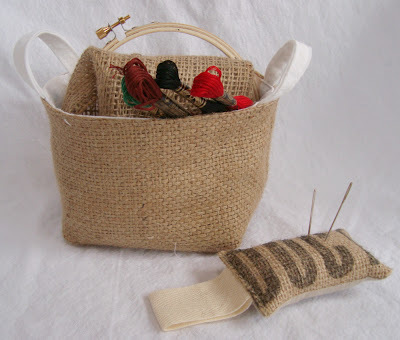 great idea to give child 's first embroidery kit. I don't remember if I did any embroidery as a kid - so maybe my first project was as a 31 year old-earlier this year. Thanks for all the project ideas on your blog! I love this idea. My daughter is very creative with paint, but I would like to introduce her to another medium. Oh Maya, that's nice. Keep all these treasures of your kids! I did some stitching around the age of 9-10 and I have no idea what happened to my tapestry. I am inspired to do something with kids today! Thanks for sharing these pieces!